We started with Aroy-D red curry, and customers told us how much they like it. 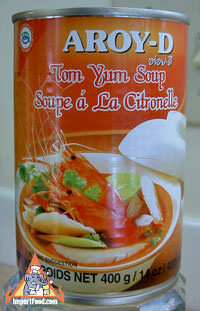 Now we're pleased to offer tom yum from the same manufacturer. This tom yum soup is made with an authentic "Thai Taste", a strong blend of both sour and spicy. It is restaurant quality. The mushrooms are high-end "het nangfah" variety, nangfah means angel. Het nangfah mushrooms are sarjor-caju in English, we love them. Each can has a few of the mushrooms, kaffir lime leaf, whole red chile, and sliced galangal. See our recipe for tom yum soup, made from scratch. This premade soup from Aroy-D is quite good if you don't have a lot of time. It's the best premade tom yum we've tasted, from dependable Aroy-D (makers of Thailand's best coconut milk). Add a bit of coconut milk after heating, if you like--we usually enjoy a teaspoon of coconut milk in our tom yum. All you do is heat it over a stovetop, add meat of choice, or add nothing at all (as we did). Cook and serve with jasmine rice. Ingredients: water, mushroom, lemongrass, soybean oil, sugar, shallot, galangal, chile, salt, coriander, red chile, kaffir lime leaves, citric acid, lime. Product of Thailand.